It’s no secret that aged pu’erh is scarce out west. The western vendor scene is dominated by vendors traveling to Yunnan bringing back predominantly young tea to sell. For this exercise, I added all of the older teas from western vendors I could think of. Unlike some of my other data compilations, this one didn’t take long at all.. The cutoff for aged pu’erh (both raw and ripe) was set at 18 years (2000 and older). Setting it at 18 years puts it firmly above semi-aged, but also not high enough (25 years) where we would have no teas making the cut. It’s a number that’s probably going to annoy some people off because its too low and others because it isn’t high enough (ask Su what aged tea is!). The dataset is sensitive to a year or two difference. If I moved it to exclude year 2000 teas, the list moves from 22 teas to 14. If I moved it to 2001, I think it would’ve expanded to around 30 teas. This is an admittedly imperfect way to look at aged tea. I originally thought to do this by some combination of storage and age, both helping to form the basic profile of the tea. There are traditionally stored teas that are only 15 or 16 years old that I’d consider more mature and drinkable than 20 year old Kunming stored tea. In the end, I decided to go strictly by year because I have not tried the majority of teas in this list and a more specific categorization can get complex and too subjective quickly. The age is also obviously subject to misinformation. There’s no great way to verify this. As noted already, this is a small sample size. See the list. It’s a pretty random bunch of tea that is divided relatively evenly between raw and ripe. This is a good chunk of the most expensive teas on the list and really bring up the average cost. Teas of known origin are going to have higher resale and collectibility value and this really shows in the price. It is telling that the $699 357 gram 1998 Dayi cake on Tea Urchin may actually be under-priced.. Most teas on this list skirt around the 18-19 year old mark. A few teas are 5+ years older and this also gets reflected in the price. This is pretty much everything else. These teas should pretty much be treated as anonymous white label teas, presumably with some age under their belt. The prices here vary a lot depending on what the vendor thinks they can sell the tea for but are generally much lower than more recognized tea. One way to choose tea well is to select from a shop specialized that does a type of tea particularly well. For instance, buy Dongding from a shop specialized in Dongding. However.. Having a shop specialized in pu’erh that is westward facing, usually means more of a specialization in young pu’erh (and perhaps a region or two within Yunnan). There’s not really any obvious vendors with a specialized bent towards aged (or even semi-aged tea). This becomes painfully obvious pretty quickly… One surprising thing about the list is that Yunnan Sourcing is the leading vendor in aged tea, having 50% of the productions on our list. Yunnan Sourcing is not a vendor known for aged tea, nor are they a vendor strategically placed somewhere like Hong Kong, Taiwan, or Malaysia to offer aged tea. They are also certainly not aged tea specialists as these 12 teas also compose probably under 1% of their total teas..
We’re beaten to death with the idea that pu’erh gets more expensive with age. And sure enough.. The tea’s median $/g is $0.47/g, with the average skewing higher due to older teas and name brand teas. This $/g is indeed higher than young pu’erh, which comes in around $0.30-$0.35/g for 2017 material. Being about 37% more expensive is a significant but a pretty reasonable amount considering we’re talking about 18 year old tea. In many ways this small price disparity says more about the craziness of rising maocha prices for young pu’erh than the price of aged pu’erh. When I crunched the numbers on teas that vendors added to their sites in 2017, I found that young pu’erh was being pressed in increasingly smaller sizes (median size: 200 grams), whereas many of the semi-aged teas were 357 grams cakes. This trend doesn’t hold up for aged tea (median cake size: 250 grams). The median $/g of semi-aged teas was also just $0.18/g, whereas our aged selection it is much higher at $0.47/g. I’d guess that a large part of the size disparity is vendors actively trying to avoid sticker shock and choosing to source smaller sized tea, even at the expense of slightly more expensive tea. A $100 250 gram brick sounds cheaper than a $143 357 gram cake even though they are actually the same price per gram. Another possible explanation is that cakes from this time period generally use better material and trend pricier, rather than bricks or tuos. More Info: 2017 Young Pu’erh, Semi-Aged Pu’erh. There’s another notable source that westerners can buy from, HK-based vendor Sunsing. Sunsing, unlike these others vendors sells a lot of Dayi and name brand productions that are easy to look up in a pu’erh yearbook. Great! Only problem is the majority of Sunsing’s teas from the 1990s currently sell for over $4/g, well over $1,000 per cake. That leaves a gap that is widening between known productions that have greater resale and collectibility and white labels which are being sold at around $0.40-$0.50/g. Is Aged Tea The Holy Grail????? One contradiction I find fascinating in the west is how a lot of people put aged pu’erh on a pedestal as their ultimate goal.. But when pushed these same people often have virtually no experience with actual aged tea. I can’t blame the westerners too much for being averse to these teas, although I do think it’s within their best interest to try the options available to them. There’s just not a lot of options and while many are OK teas, the price prevents us from getting experience with higher-quality and more acclaimed teas. This lack of experience could prove consequential.. As more and more people get into pu’erh and attempt to age it, even if their setup ages the tea OK I wonder if they’ll eventually end up with something unfamiliar. This entry was posted in Aged Pu'erh, Article, Raw Pu'erh and tagged Adventure in Every Cup, Bitter Leaf Tea, Chawangshop, Crimson Lotus Tea, Essence of Tea, Tea Urchin, Tealife.hk, White2Tea, Yunnan Sourcing. Bookmark the permalink. Seems like every time a vendor offers a nice aged tea, at a reasonable price, a single buyer swoops in and buys most of it. After awhile I bet some vendors never even get to listing that tea when they have private buyers an email away from a sale. Semi-aged is mostly now falling into the 2005-2009 time period that got a bad rap from overpicking and plunging prices. Maybe there are more of these teas available and the prices did not recover so much. While I agree somewhat, I’d push back slightly. I haven’t heard too much of these teas being dealt exclusively behind the scenes. Not saying they aren’t, but I haven’t heard of it! While I do agree that these teas will usually sell out quicker than others, I think that speaks to the paltry amount of teas there are being sold. If there’s only 10 options or whatever for aged pu’erh and one shows up that stands out, it makes sense that it’d get bought out fast. There’s about 100x the amount of options for young pu’erh, so a standout one may stick around for a bit longer on average there. It’s never a single buyer… just a bunch of individuals looking for a good deal on an aged or semi-aged cake. Everything I purchase for re-sale gets listed on the site. I am a lover of older puer but it’s clear that semi aged is the value today…if the quality is there. As Cwyn mentioned above, there were issues with teas after 2004…though tastes will change over time as this older tea dissappears. 20 years ago who would have thought young puer would be so popular to drink. Look at ripe popularity in HK the land of traditional storage sheng. I agree with your semi-aged pick as value. Still, it’s very worthwhile for people to get some experience with older tea in my opinion. I’m constantly amazed at the amount of people that act surprised that sheng can even brew red or orange. Speaks to which teas people are getting experience with pu’erh these days. I really enjoy the last paragraph of this post and have recently wondered aloud such things. I wonder if a blind sample of antique puerh showed up at your door, would people reading this even be able to enjoy it or even have any idea what it is? Aged puerh is a lot more weird that fresh young puerh that’s for sure! An acquired taste. Definitely never going to pass the mom test. 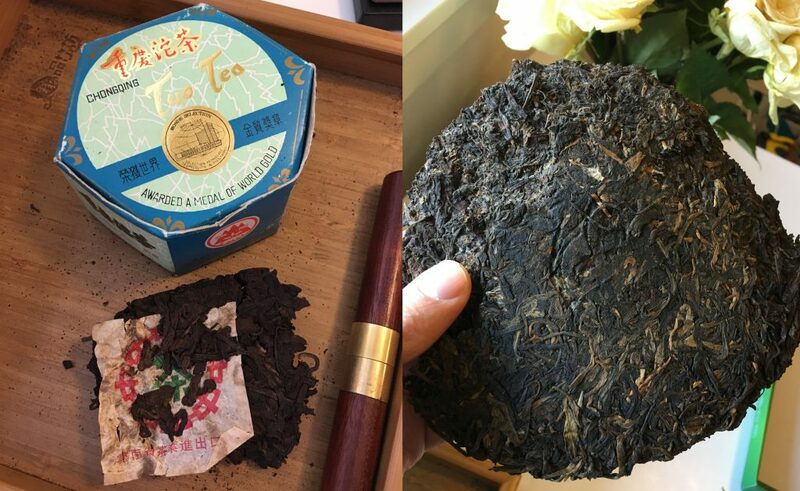 I concur, I think your post on aged oolong points the finger at the fact that the idea of “aged puerh” is more conceptual than a reality in that its stepping into the “stamp collecting territory”. I’d hate to think that Cwyn is right, but I also suspect that there is plenty of aged puerh sitting in private collections never being graced by have the opportunity of coming into contact with water or teaware. We should all reasonably know by now that not much is going happen after the +50 year mark so is there going to be a lot of people drinking large quantities of tea in their octagenarian years? I’d rather drink it now whilst I have the senses and the faculties to enjoy it! The when to drink question is also quite interesting. Still, I think the majority of us have pu’erh that is under 18 or 20 years old. The thought of us finally drinking it at 80+ years old is laughably absurd but also believable in a sense given some of our hording tendencies. Agreed. I also like aged pu’erh, but I wonder if some people know what they’re even buying into. In many ways, I think aged oolong is more friendly to the unfamiliar than aged pu’erh. It probably does better on the mom test at least. a) if you exclude 2001 and later, the real availability of tea precipitously declines. There are very few good teas available on Western facing shops. b) Aged tea is not 47 cents a gram on average. I mean not really. It’s not even about the premium for famous names like Dayi or Xiaguan. Most teas that are decent at all, beyond the sort of no wrapper ’90s tea that W2T sold or the CheShunHao promoted by MarshalN, are generally going to be more than $200. $1k isn’t unreasonable for just the better tea of the ’90s, and there are many teas that are way more than that. This isn’t really about aged tea as a whole, as the scope is set to a paltry amount of teas from a very small selection of the pu’erh market. It’s more modestly focused on what is available to the western audience. In my opinion, the only real takeaway from the data is that there just aren’t many options from easy to buy from western facing vendors. Most of the options aren’t that appealing either. (a) I did explore expanding the data when I originally created it. If I changed it to 2001, 2002, or 2003 there would be more teas but it would only have marginally affected the data as most of those teas were other anonymous options between $0.20-$0.50/g. It would’ve pushed the $/g down a little bit and added a few more teas. (b) $0.47/g. Yes of course that’s not a very good proxy on name aged tea, but that’s not really what’s being actively sold in the west. In the more white-label category it is not too difficult to find tea for significantly under $0.50/g in HK or Taiwan. Is the tea really that old? Maybe, maybe not. But many of them at least do have a traditionally stored profile. I agree that the $0.47/g is not a very interesting number, as it kind of just falls arbitrarily in the middle of our random mish-mash of teas. The key part is that this is more what’s easily available out west and how expensive it is compared with pu’erh from other categories that people buy. Tealife.hk sells a few HK-stored things at about $1/g, which are just barely too young to make the cut for this list. Since he apparently buys HK retail and marks them up, I’m guessing that there’s a fair amount of ca 2000 big-factory tea in HK for about $0.50/g. My experience with 90s tea is so slight I can’t really have an opinion, but the ones I’ve tried are not hugely better than the Y2K stuff, which in turn seems noticeably superior to teas from even a few years later. I’d be curious to see a regression analysis with age as a variable, or perhaps fixed effects for year of production (and brand). This would of course not work on this small of a sample, but for say a database that includes teas from the past 10 years it might be interesting to see the results. I think you have compiled such a list. All in all, I applaud this effort, though we can only tell so much with only 22 observations. But they do tell us something! Yeah, I think the most telling part of isn’t anything within the data but the sheer lack of it. It speaks to the teas that are available out in the west. Westerners really do lack experience with truly aged teas, and I think this points pretty clearly at a lack of access and choices. I have recently begun reading MarshalN’s blog from the beginning (currently around February 2007). As a westerner (US) I find it informative and it gives me insight into the tea market in China, but I also find it depressing. Depressing because I know many of these teas are either not around anymore or not feasibly available. I have really enjoyed the few aged and semi-aged teas I have tried, but the barrier to entry for me is a problem. Hopefully a trusted vendor will open these teas up to the western market! Thanks for the note. It is a bit depressing seeing what teas were available back then. The situation hasn’t really improved either. I’d recommend checking out some of the non-traditional vendor sources, like LP, Dead Leaves Club, and Emmett if you haven’t already. Great analysis. Also shows in these responses how many smart people are thinking about puerh. I agree there aren’t enough choices for getting aged Sheng puerh here in the west. It’s valuable because of its scarcity and most of us will never try a 50 year old puerh tea, as you James have in the Wistaria 60’s raw puerh video. This kind of aged tea becomes a gift tea for special occasions and is too rare or expense to buy or sell. So the idea is, the value in it is who you know, not what you own. Personally, I’ve had 40 yr old tea maybe 5 times in my life and 50 yr old twice. The holy grail is that extra decade. If I didn’t personally drink with a HK raises teashop owner who was generous enough to share some of her very limited personal stash I couldn’t even imagine gettting some of this tea to compare anything else to. I also agree it’s much smarter to purchase tea in the 10 year range that comes from a region you like and a vendor you trust and sit on it with a pumidor for at least 10 years. That decade will go by quickly ! Thanks for the comment. For me too, it’s largely been through the generosity of veteran tea drinkers that I’ve had the privilege of trying those older teas. While it certainly isn’t the same, I do hope that there can be a few more options that are at least 15 years or older. 1. They will get lost or damaged during shipping. There are limits to insurance claims. 2. Chargebacks and fraud. I lost more than 20k USD in chargebacks in 2017. Pretty much all of it was people that bought the pricy pu-erhs. 3. Anytime someone is spending such huge sums of money they become paranoid and anxious about every little thing. Trying to provide some impeccable pedigree and re-assure these buyers is time consuming. Can you imagine taking a return on a $5000 cake that had been opened by the customer, but they didn’t like it, or it didn’t taste like the Taiwan stored one they had? I suppose if I had a big pair of brass balls and didn’t mind being on an emotional roller coaster I’d offer some of these teas. Being a tea seller is a big enough PITA as it is! Great points and thanks for chiming in Scott! Those are all things that would not have come to find intuitively for me as a consumer.